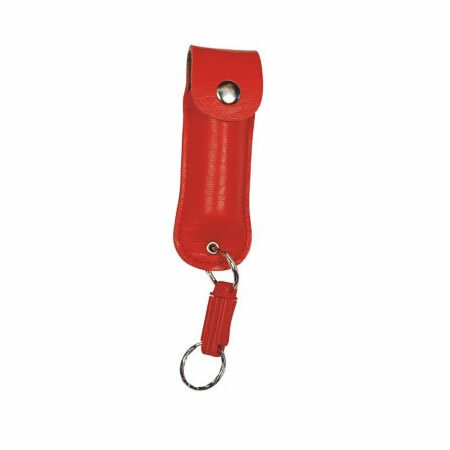 Leather holster key chain self defense spray. Available in 4 color choices. You get free shipping on any order $50.00 and over. If your order is $50.00 or above, you will have an option to choose a zero cost (Ground) shipping method during checkout. When you choose this no cost shipping method, we will ship your order right away using either the United States Postal Service (USPS) or United Parcel Service (UPS) at our discretion. You will be notified once your order ships and will receive the tracking number for your shipment via the email address you provided during checkout. Of course, if you would rather we ship via a specific method at your cost, you may choose that method and we will ship your order to you via your chosen means of delivery. You get a full 90 days to return a product! If at anytime during this 90 days, you find you are unsatisfied with your purchase, you can request a return. We only ask that you follow our return policy so we can properly track the package and route it to the correct department for processing of either your refund or replacement. This self defense product is exactly what you need in order to help protect yourself in the event of an attack upon your person. It's an inexpensive method of immediately stopping an attack and allowing yourself time to get away and call the police. Self defense pepper spray is sold in retail stores and online at websites like this one. We've been online right here since 2000 and have committed to maintaining high standards in all of the protection products offered to you. Here at TBOTECH, we have three quality brands that you can rely on to keep you safe. We've carried these particular brands for nearly twenty years now. These are Pepper Shot, the keyring breakaway model is featured on this page, Wildfire, for even greater hottness, and Mace brand, depended on for decades. Defensive sprays have different potencies. For self defense purposes, the one that causes the most pain and discomfort to the person trying to attack is the one most chosen by customers when asked what kind of spray they are looking for. 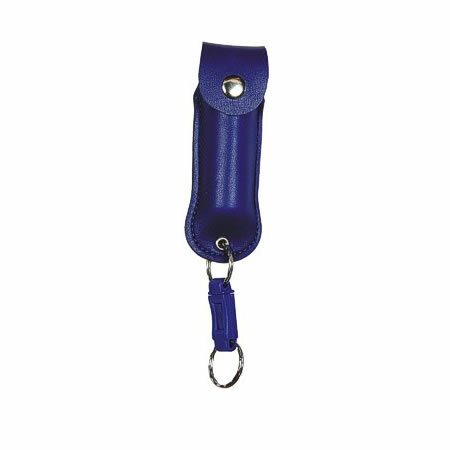 The one on this page (in your choice of color) for $9.95 is the Pepper Shot 1.2% MC 1/2 oz pepper spray with leatherette holster and quick release keychain. Pepper Shot is made with 1.2% Major Capsaicinoids. 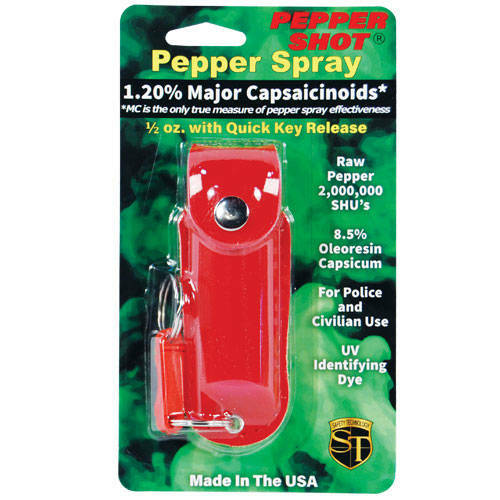 The Major Capsaicinoids are the true heat measure and 1.2% MC is more effective than of most other pepper sprays. In addition to causing an attacker pain, The 8.5% oleoresin capsicum formula swells the mucous membranes, which makes breathing difficult; and swells the veins in the eyes, causing the eyes to close. It's made from 2,000,000 SHU's of raw pepper and these effects can last up to 45 minutes yet cause no permanent damage. Has a UV identifying dye to help aid in the identification of an attacker. Pepper Shot 1/2 oz. 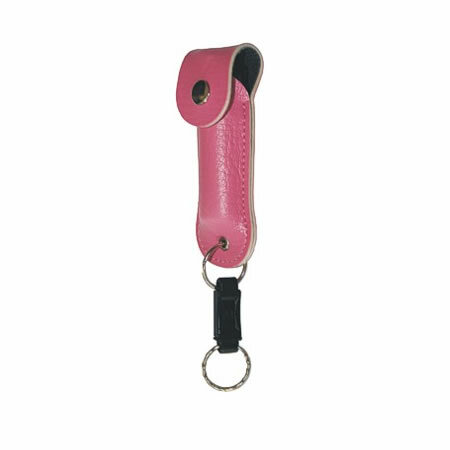 Pepper Spray has a range of 6-8 feet and comes with a leatherette holster. 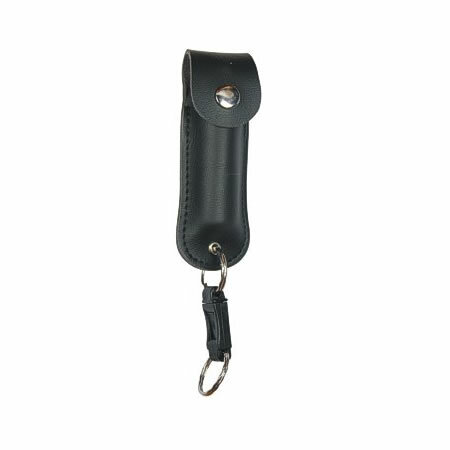 Each unit provides 6-10 one-second bursts and comes with a quick key release keychain, and safety lock. 4 ¼" x 1 ½"
The police will have no problem identifying who you sprayed because there is a vegetable dye contained in the pepper spray which easily identifies the attacker. You can get a great model by purchasing on this page. Or browse around the website and find dozens more models to choose from. 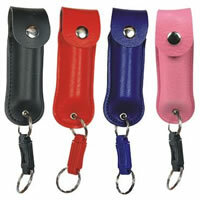 This PS-LH in a leatherette holster made by Pepper Shot™ is small enough to carry on your keyring. Keeping your defensive spray accessible at all times is necessary if you plan on using it for self defense. If you have to fumble through a purse, pocket, coat or whatever in order to find it, you've already lost valuable (possibly life saving) time. You need to be prepared to use your spray immediately if you are threatened. Keeping it readily available will ensure you are prepared both physically handling it and mentally prepared to employ it when necessary. By keeping it on your keyring, you will mentally always be aware of it and it's defensive use; and you will have quick access it to it when you are threatened with violence. Keeping yourself safe is everyone's top priority. Give your safety an extra layer of protection with any of our Pepper Shot pepper sprays. Receive FREE UPS Ground or US Mail shipping on all orders of $50.00 and up!